Launch Pods help to launch your day the organised way. Launch Pods come in a range of sizes; MonoPod (single unit), DuoPod (two units) TrioPod (three units) and QuadPod (four units). Launch Pods come flat packed so assembly is required. For those living in the Sydney Metro area Mr StuffMaster can deliver your Launch Pods pre-assembled for a small fee. Launch Pods can be individualised by painting in a range of colours. Choose from our pastel range or vibrant range. Magnetic whiteboard, pen and two magnets. Keep track of each day's needs using the whiteboard we've included. Bag area comes with two repositionable hooks for hanging library bags, hats and jackets. Each hook can hold up to 1.3kg. Upper cupboard contains an adjustable shelf with soft-close hinges. Store homework books, artworks and permission notes in one easy to find location. Use the other shelf for storage of small items. 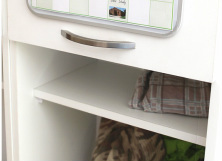 Slide out drawer for storing shoes, sports equipment, or toys. Can be completely removed and used as a toy box in another room. Add something extra to the bag area, below the upper cupboard. Choose between an extra shelf (as pictured) OR a rail. $10/Launch Pod for this option. Joiners can be used to join multiple Pods together. For example when joining several MonoPods, or a TrioPod and DuoPod. Joiners are $5 extra.